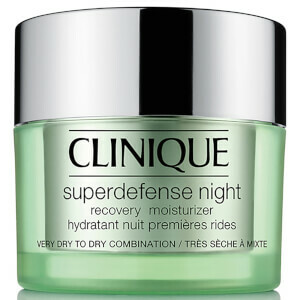 Look after your skin with Clinique's Superdefense SPF20 Daily Defense Moisturiser for Very Dry to Dry Combination skin. With a silky, lightweight formula, the moisturiser glides effortlessly onto skin, melting in quickly to create a moisture barrier which acts as a shield to protect from external aggressors. Its innovative formula also helps prevent the first signs of ageing with UVA/UVB and antioxidant protection. Skin feels soft, comfortable and nourished. - K.N. Follow with your nightly moisturiser. Amazing if you rarely wear makeup, it is light while hydrating and the SPF is an added bonus! However when worn under makeup it causes my undereye concealer and power to become patchy and flake off! This means that I can only wear it on no makeup days, which for me is not good value for money and I won't purchase again. This moisturises so well and make-up goes on easily over the top. Skin feels soft and protected all day. Just wish they did a higher SPF in this format? I love this stuff, I really do. It feels gorgeous, does the job and manages a really good and without being claggy or heavy.